Just peachy and so Southern! 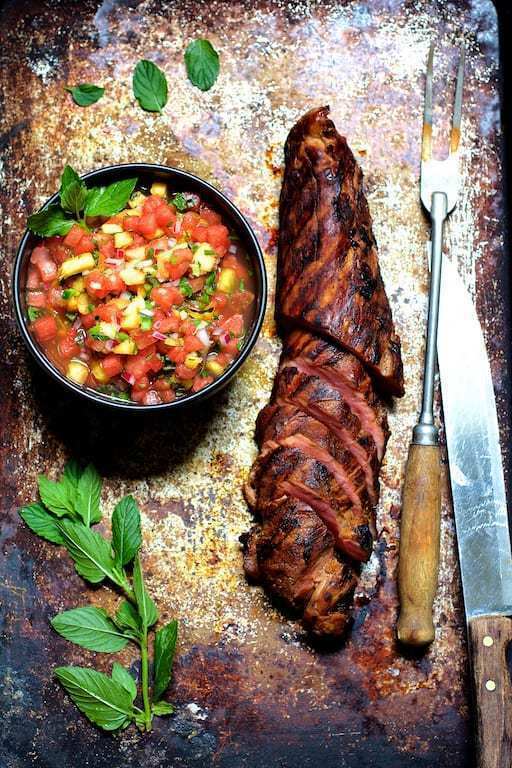 Bourbon-Marinated Pork Tenderloin with Peach Watermelon Salsa is a lovely summery dish for two. MARINADE AND PORK: Combine bourbon, soy sauce and brown sugar in a gallon-sized zipper-top bag. Add the pork tenderloin, seal and squeeze the bag to evenly distribute the marinade around the pork. Refrigerate at least 4 hours and up to 12 hours. Turn the bag occasionally. Preheat grill over medium heat. Remove pork from marinade and pat dry, reserving marinade. Grill low and slow approximately 30 minutes, basting and turning occasionally. (Baste up to approximately 5 minutes before removing pork from grill.) Pork is safe when it reaches an internal temperature of 145 degrees. Allow meat to rest 10 minutes before slicing. Slice diagonally against the grain and serve with salsa. SALSA: Whisk jam/jelly and balsamic vinegar together. Add remaining ingredients and stir to combine.